Interventional radiologist Jaywant Parmar, MD, recently needed to reach the right hepatic vein on a patient with a very cirrhotic and shrunken liver. The patient’s right hepatic lobe had a region of geographic enhancement suspicious for neoplasm. Because of the scarring, the position of the colon, and the proximity to the heart, Parmar couldn’t do a percutaneous biopsy. But he could do a transjugular liver biopsy, where a small tube is inserted into the jugular vein in the neck and x-rays are used to guide the tube into the liver’s primary vein. However, because the region he needed to reach was right below the heart, he was concerned about the patient’s safety and the possibility of puncturing the heart. “It was a real anatomical challenge,” says Parmar, of Radiology Associates San Luis Obispo in California. Parmar used the Veran IG4, a new navigation system for guiding certain radiology procedures, including biopsies, ablations, and drainages, to complete the challenging case. Using the system and the guidance-enabled transjugular biopsy needle, which shows the radiologist’s needle as it navigates the human body in real time, he safely completed the procedure. The Veran IG4 system uses electromagnetic localization and 4D registration to display an interventional instrument such as a biopsy or an ablation needle on a computer monitor with respect to anatomic imaging and treatment planning. The system is compatible with GE Healthcare’s Innova Imaging systems, which can acquire CT-like images of target organs that can be exported to the navigation system in the same imaging suite. The National Cancer Institute estimates that more than 1.5 million new cases of cancer were diagnosed last year. Reports indicate that an increasing number of those cancers are located in internal organs such as the thyroid, the liver, and the kidneys, which can be harder to reach. Historically, cancer patients have been treated with surgery, chemotherapy, and radiation, often with some combination of the three. In recent years, newer image-guided minimally invasive treatments have proven effective for cancer treatment. Interventional oncology is a growing field. The interventional procedures used to destroy primary tumors and metastases are often performed under real-time image guidance. These procedures can be challenging because they require multimodality planning, real-time guidance through complex anatomies, and the ability to treat selectively. The Veran system’s capability to achieve these goals is why Parmar believes it has great potential in oncology. And Parmar says the system has great potential for other applications, including intravascular procedures. French Hospital, a Radiology Associates San Luis Obispo site, is building a hybrid operating suite-angiography lab, “and we’re definitely thinking of going with GE if they’re going to build integration of the Veran system into the room,” Parmar says. Besides providing real-time guidance to help make procedures safer, the navigation system can reduce radiation exposure. Without a system such as IG4, interventional radiologists would have to take a CT scan each time the needle was moved to confirm it was properly aligned and not in danger of hitting a vital structure. The IG4 system typically requires only one or two scans vs. three or four without the system. The first step when performing a procedure is to have the patient undergo a traditional CT scan. Data from the scan are loaded into the IG4, then three small pads are placed on the patient’s body in a triangle around the procedure area. The pads sense the needle’s movement and transmit that information to the IG4, which overlays the needle placement onto the CT image. Michael Ringold, MD, an interventional radiologist at St. Luke’s Hospital & Health Network in Bethlehem, Pa., has been using the IG4 navigation system for just under a year. At his hospital, he says, interventional radiologists can perform some procedures using the navigation system with its newer GE Innova scanner that takes fluoroscopic images that are postprocessed into a CT scan. Procedures using the CT scanner can take 60 to 90 minutes. Being able to do interventional procedures such as biopsies and drainages with its Innova scanner means other physicians have more access to the CT scanner, he says. But what Ringold likes most about the IG4 system is that it allows him to take different approaches to reach an area of interest. Traditionally, he says, the best option was a straight line perpendicular to the body axis, which could be problematic when the tumor or the abscess was located in a difficult area to access. For example, in a recent case, the patient had an abscess on the dome of her liver from which fluid needed to be drained. The abscess was directly underneath the patient’s diaphragm, and a straight line would have taken Ringold through the lungs. Using the IG4 system for guidance, Ringold started the procedure by the tip of the liver, lower than where he would have started without the system, and worked his way up to the patient’s diaphragm. It took only a few seconds, which was much quicker than if he couldn’t see the needle advancing. The interventional procedures done with the IG4 system are performed under conscious sedation with a local anesthetic to the skin. Two images are taken—one with the patient inhaling and one with the patient exhaling—and used to calculate the respiration movement. “But the machine assumes that the patient is not moving,” Ringold notes, adding it’s best when the patient lies still. Nutting says the system reduces much of the guesswork involved with such procedures. “It takes a lot of the things that I do in my head—looking at the images and planning how to get where I have to go—and puts it on a screen in front of me,” he explains. At last year’s Society of Interventional Radiology meeting, presenters showed how they made fewer passes through the body using the Veran IG4 navigation system vs. conventional CT guidance. Another reason the system is safer for patients, Nutting says, is because every time the physician must traverse the surface of an organ, it increases the risk of bleeding. “With this system, you have to traverse the surface of the organ only once, so the chance of complications from bleeding is lower,” he explains. Nutting discovered the navigation system reduces the time it takes him to perform most procedures. Ringold finds procedure times are about the same using the navigation system vs. conventional approaches. No studies have proven that the navigation system improves outcomes, according to Nutting. “That’s something that still needs to be proven, but it is very valuable technology,” he says. Nutting expects that it’s only a matter of time until studies do show its efficacy. “I think the accuracy is very good,” he says. Parmar says not only does he expect the system to be proven safer than conventional approaches, but he also expects that ways to use it will expand over time. “I think the guidance technology will create opportunities to develop new approaches to minimally invasive surgical procedures,” he says. 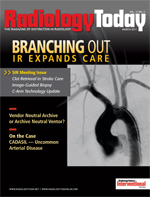 Interventional radiologists who have used the system typically report a learning curve. Nutting says it takes about five cases to understand the technology and its limitations, “but once you’ve done a couple of cases, it’s fairly intuitive,” he adds. “There is definitely a learning curve,” says Parmar. “You have to make some mistakes and drop some needles … and set up the room wrong once or twice to know where the generator has to be in relation to the patient.” Also, he says, the technologists need to know that the pads can’t be repositioned after the scan is done. Another drawback, Nutting says, is that some tumors or abscesses can be hard to reach if they’re more than 20 cm from the skin. “The further you get away from the skin, the more difficult it is to use this device. Normally, you don’t do that anyway because the needles aren’t that long,” he says. A heavier patient with a larger body mass also can present challenges because the system can only penetrate so deep.